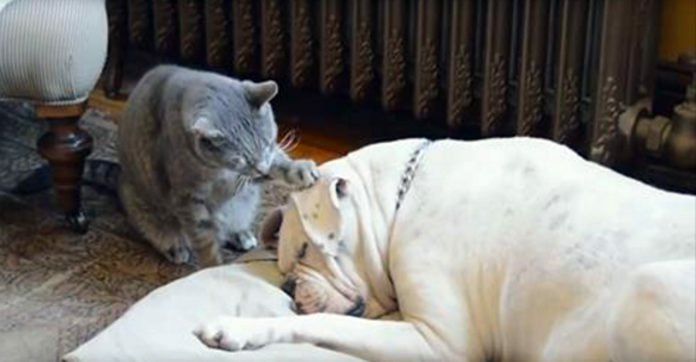 Cat Tried To Wake Up His Sleepy Friend… And What Happened Made Me Laugh Out Loud! The phrase “to fight like cats and dogs” has been disproved many times, as many pups and kits get along just fine and even become best friends. But the fact remains that due to their differences, there can be some disagreements here and there, especially when it comes to moods. This cat right here really wants some playtime and attention from her doggy buddy, but he’s lazy and very much asleep at the moment. She tries her best to wake him up by head-butting him and patting him all over with her paws, but to no avail. He’s really out cold for now! The cat is quite persistent, and she goes at it demandingly for a while, but there comes a point where she realizes it’s a lost cause. Giving up, the cute kitty rolls over and flops onto the floor in defeat. She seems to think, if you can’t beat them, join them! Don’t worry little cat, I’m sure your dog buddy will want to play once he wakes up!